Thank you to Evelyn Lamb, who submitted this post about her Grandmother, Marge James. Evelyn’s Scientific American blog is called Roots of Unity. This is my grandmother Marge James, medical technologist and women’s rights activist. 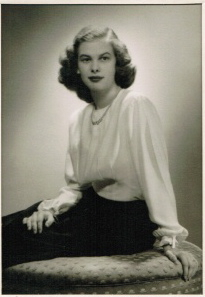 The picture is her engagement portrait from 1948. I emailed her about being on this blog, and she sent me a wonderful email with some thoughts about her work and some family remembrances. After graduating, she became a medical technologist and worked at a few different hospitals, eventually settling in Troy, Ohio with my grandfather. “Many professions were not considered suitable for women. Teaching, secretarial work and nursing were OK and the Med Tech also, though there were men in the profession too (the men usually ended up in charge). I can remember people saying that they would not want a woman radio or TV announcer as they had such high pitched voices. Though I did know one woman pharmacist, it was just not generally considered a job for women. A few determined women were becoming doctors and lawyers, but they had tough times getting accepted and established. Even when I went to work the general feeling was that it was OK for a married woman to have a job if she didn’t neglect her other duties. This was true even when it was the family’s only or primary income.” Grandma mostly worked part time after my mom was born in 1954. 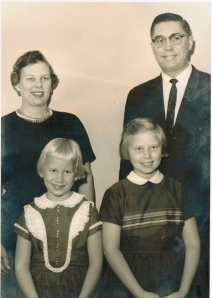 Above: The James family in 1961. Grandma and Grandpa in the back, my aunt and mom in the front. She also expanded on a story my mom used to tell me about pregnancy tests and rabbits. “When we did pregnancy tests, we would inject urine into a female rabbit’s ear (that was usually a pretty good vein), and 2 or 3 days later, we operated on the rabbit to examine her ovaries. Pregnancy had a distinct effect on the ovaries. We could use a rabbit 3 times. Operated twice and the third time we killed them. Rabbits were also good to show our very young children that had to have blood tests. Seeing the rabbits helped dry their tears. Most of us in the lab would now and then take a rabbit we had killed home to cook it. It sounds a little gross now, but we ate rabbit every now and then. Later we used frogs for pregnancy tests.” When my mom used to tell me about eating the rabbits used for medical tests, I thought it sounded so strange and otherworldly! She and my grandfather celebrated their 64th wedding anniversary last year. They still go to the gym to swim a few times a week and play bridge weekly. When my husband and I visit, we try to get a game or two in with them. We are still learning, and they go easy on us, but I can tell my grandmother is an extremely wily player. If we weren’t family, I’m sure she would be out for blood! All my grandparents have been hugely supportive and loving to all of us grandkids and encouraged us to find our own paths in life, whatever those are. 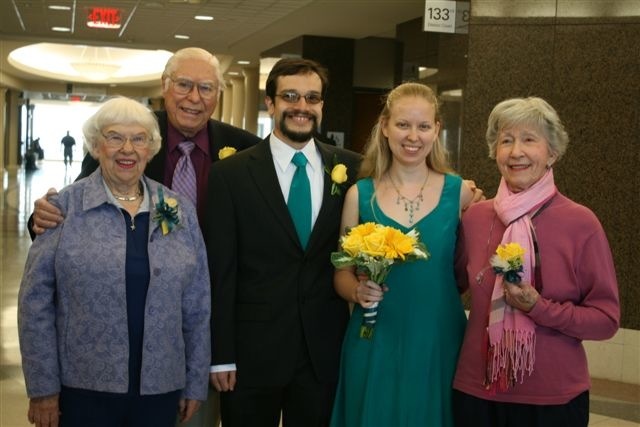 Above: My grandparents with me and my husband at our wedding in 2010. From left: Grandma James, Grandpa James, my husband Jon, me, and Grandma Lamb. Thank you, Evelyn, for asking Marge to give you this information. Thank you, Marge, for sharing it with us. It is a tribute to an everyday hero.